Our Battalion, the 6th Regiment, 1st Division, A.N.V., a reenactors umbrella organization, has adopted Hardee's Rifle and Infantry Tactics as the standard drill manual. Pocket soft cover editions are available from many sutlers at modest cost. We recommend that you obtain one for home study. The language can be difficult, but it is very useful for review of maneuvers you have covered in drill. The 1st Sergeant will command, Fall In, One Rank, By Height. Soldiers will fall in, tallest to the right. The 1st Sergeant will command, Attention Company, In Two Ranks, Form Company, By the Right, Double Files, Company Right, Face. All soldiers will face to the right, except the tallest man. on the right side, who will face about, and take one pace forward (the original rear). The 1st Sergeant will command March, at which time all soldiers, except the man faced about, will marchforward, the second man in line placing himself behind the man faced about, and facing to the original rear. The next man places himself beside the first man, the next to his rear, and so on. The result is a formation in two ranks, faced to the rear. The 1st Sergeant will then command, About, Face, and soldiers will face to the original front. The 1st Sergeant will then command, In Each Rank, Count Twos. The soldiers in the first file will count "One," in the second," Two" and so on down the line. This count must be remembered at all times. The Captain will command, To the Rear, Open Order. At this command, 1st and 2nd Sergeants will step four paces to the rear. 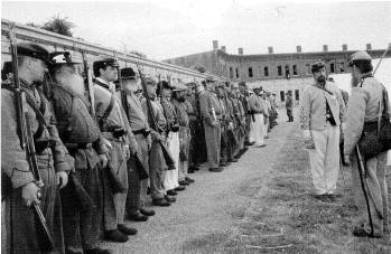 At the command, March, the rear rank will step back to the line established by the Sergeants. The Company will then be put through the Manual of Arms, which can be found in Hardee's Tactics, School of the Soldier, or reviewed by any officer or N.C.O. Right Face. Lift the right foot and spin to the right on the left heel. Replace the right foot. Left Face. Lift the right foot and spin to the left on the left heel. Replace the right foot. About Face. Lift the right foot and place it at a right angle with the left foot, heels three inches apart. Spin to the rear on both heels. The Company will automatically double into four rankson any facing, or undouble to two ranks at the command Front. The Company will face in the given direction, and the rear rank will step one pace to the rear to allow room for the doubling. Right Face. After the facing, soldiers who have counted "two" will step one pace over and one pace up to the right side of the "ones". Left Face. After the facing, the "ones" will step over and up, to the left side of the "twos". Front. After the facing, the soldiers who have doubled will step over and up to their original places. The rear rank will step one pace up to close to their positions. The following are the basic close order maneuvers, which can be found in Hardee's Tactics, School of the Company.